Discussion in '1940' started by dbf, Oct 14, 2014. Am looking for any information regarding this unit. 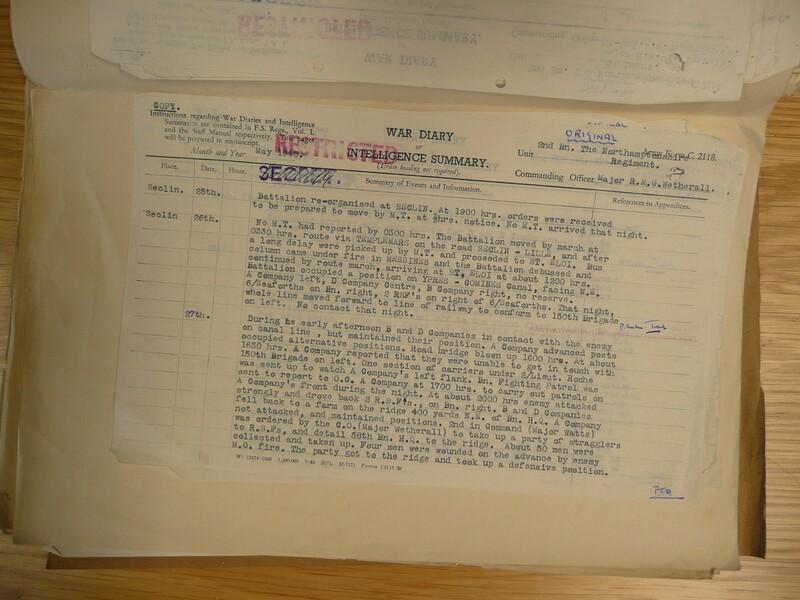 A friend's grandfather served with 2 Northants and was captured around 23/24 May. It's the usual story, never talked about his experiences, so I said I'd see if the forum could help find some background for the family. 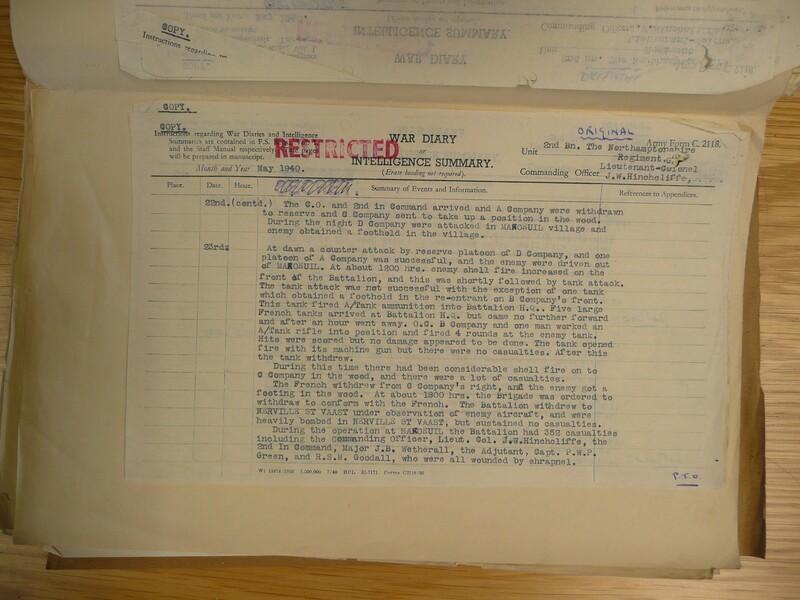 Also, if anyone is going to Kew and could check if Liberation report was ever completed, that would be fantastic. Please PM me for details. I'll send you the war diary and missing men file this week. Drop me a PM with his details and the ref for QL Report and I'll look him up for you on Thursday. Thanks Andy you're a star. Looks like it may have been the 23rd May he was captured, it looks fairly quiet on the 24th May. Rich Payne has some good knowledge on the Northants so maybe able to add more-I know he has a copy of the regiments history. ramacal and dbf like this. After one night on the Ridge the battalion withdrew to Manoevil, south of Vimy Ridge, and occupied a position covering the River Scarpe. Since the MT, which was carrying all the picks and shovels, did not arrive until some six hours later, the digging of weapons pits in the very heavy chalk soil was commenced, using entrenching tools. The position was held with, right, A Company in a wood; centre, B Company holding a spur and a re-entrant running into the position left, D Company in the village of Manoevil. C Company was in reserve. At 1300 hrs B Company spotted twelve enemy tanks and six TCVs at about 3,000 yards in front of their position, but the artillery was not able to engage this target. Soon after 1500 hrs A Company's position in the wood was subjected to heavy shelling, and B Company also came in for several concentrations. Both A and B Companies had many casualties from shells bursting in the trees. 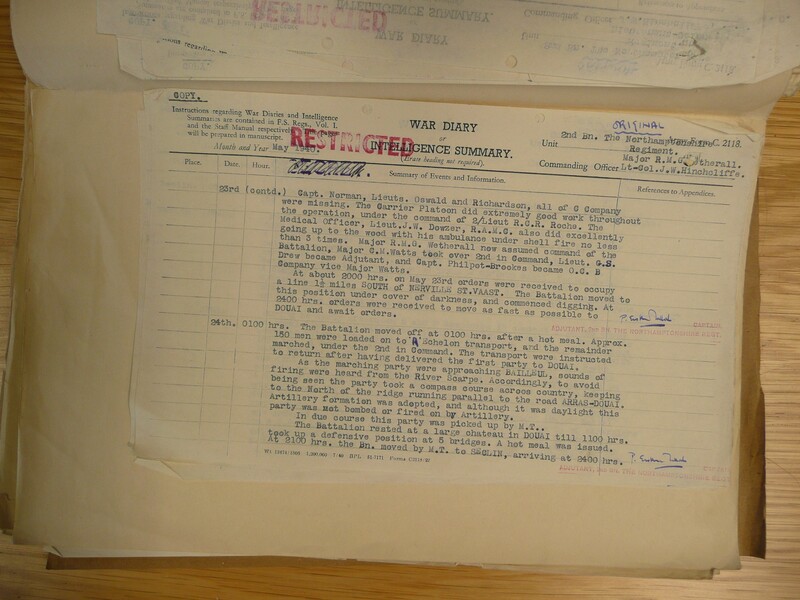 A Company was withdrawn to Battalion Reserve and C Company sent up to relieve A Company. During the night D Company were attacked and the enemy gained a foothold in the village of Manoevil. A counter-attack at dawn by the Reserve Platoon, D Company, and one platoon A Company restored the position and the enemy was driven out of the village. At midday increased enemy shell fire proceeded and tank attack. This attack was beaten off with the exception of one tank which got into the re-entrant in B Company's position and fired AP shells at Battalion HQ; four rounds from an anti-tank rifle appeared to do no damage although direct hits were scored. Apparently expending all its ammunition the tank withdrew. Meanwhile C Company had been subjected to continuous shelling (wounding the Company Commander) and, as the French on their right withdrew, the enemy gained a foothold in the wood. At 1800 hrs the Battalion was ordered to withdraw in order to conform with the withdrawal of the French. During the action at Manoevil, lasting two days, over three hundred and fifty two casualties had been sustained, including the CO, Second in Command, Adjutant, and the RSM. I believe the village and wood on Google Maps is called Maroeuil, NW of Arras. Big thanks again for that Andy. Found another thread, for a few days later which leads on from this action . ramacal and Drew5233 like this. There are two official histories that cover the 58th as they are also included in Jervois' "The History of the Northamptonshire Regiment 1934 - 1948" which covers all battalions. 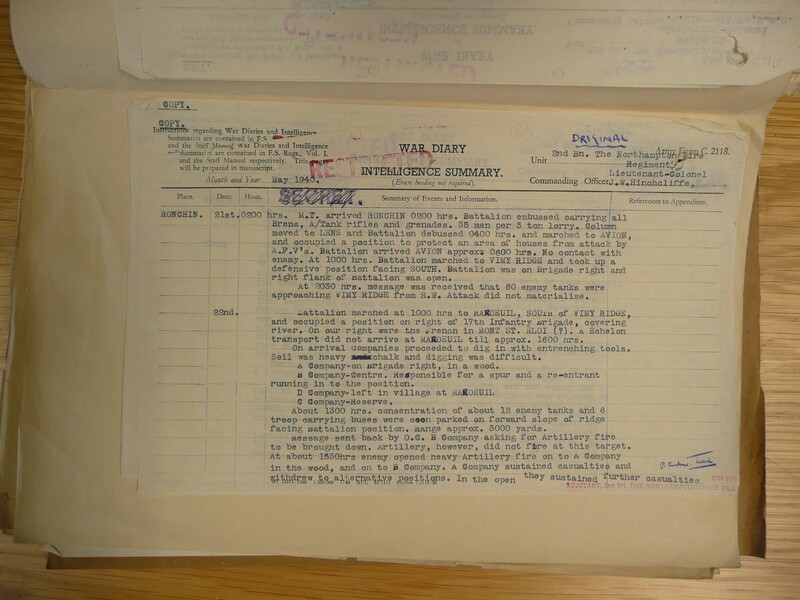 I had rather thought that it was based principally on the war diary but there seems to be additional information included. "At 14.15 hours, the Brigadier heard from his liason officers that the French tanks and infantry had gone northwards to deal with an enemy threat in the direction of Souchez. This left the right flank of the Brigade even more completely in the air than it had been before and there was considerable danger that it might be surrounded, so he decided to withdraw to the line of the Arras-Bethune road. It was no easy matter for the 58th to get out of their position, as many of the lines of withdrawal of the forward companies were commanded by the enemy. ; however, three of the companies managed it and moved some two miles back under heavy shelling and air attacks. Unfortunately, 'C' Company either failed to get the order to withdraw or were surrounded in the wood before they could do so; their commander, Capt. Norman was wounded and he, and many others were taken prisoner, so henceforth the battalion had only three rifle companies." Diane, did your friend's grandfather join up in Northern Ireland ? 2nd Northamptons were of course at Ballykinler from November 1935 until the outbreak of war, so presumably they recruited locally. Drew5233 and dbf like this. Many thanks for that explanation about their flank. Sorry to say friend doesn't have much to go on so I can't confirm anything about enlistment. I have advised about records, so I'll pass on that snippet about Ballykinler. I'll get the other files in the post this weekend. Interesting that my dad also called it MANOEVIL incorrectly. He was captured here on 23rd May (C Company). It's in the diary he kept the duration of his captivity. He was assisting the machine gunner (Knight) when he died. My dad rolled into a crater and was captured. Drew5233 and Rich Payne like this. Also captured at the same time was medic Bert Colbourne. There are 32 men from the 58th in Maroeuil Communal Cemetery. Thank you so much. I wonder if that's the machine gunner? can you help me with a quote from this wonderful book? Its on the 27th of May and talks about B company getting good support from the Gunners. They talk about them engaging a mortar in the woodland opposite them on the other side of the canal. This mortar is the one that wounds 2Lt Kempthorne and disrupts Monty Stopford's journey back to Bde HQ. Iain, I don't have a copy of that book, but one has attached the pages from A HISTORY of the 58th, 1939 1945. 2nd BATTALION THE NORTHAMPTONSHIRE REGIMENT. Looks as if page 4 is what you require? Superb! thank you ever so much Stuart. this will help me loads in confirming some of the details of the interfacing units.